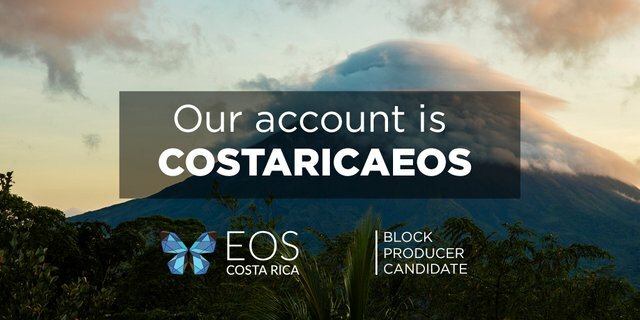 Here at EOS Costa Rica we are overwhelmed with the amount of support we've seen from all over the world. This inspires us to keep on working to gain the respect from many more EOS holders. We wanted to take a moment to thank all our current voters and supporters. If you voted for us, THANK YOU!!! We will do everything we can to make sure we are worthy of your future vote as well. You are our inspiration and we can't thank you enough for the positive trend we are seeing in our position. We take that as a huge vote of confidence and we are more motivated than ever to keep on moving forward! If you haven't voted for us or haven't voted at all, we get it. There are plenty of great candidates out there that have built great applications, amazing communities, invested in infrastructure and proven as some of the most technical minds in the blockchain space. Kudos!! We also know that some voters are waiting for more vetting of voting portals and wallets. We understand that too. You have taken a risk investing in a new technology and are in no rush. Although we think there are some great voting portals and wallets out there, we understand if you need more time. We will be patient and continue to work hard to improve our value proposition everyday. Hopefully when you are ready to vote and have done the right amount of research, our actions will speak for themselves and we will be deserving of your vote. DMeetup, dapp to help organize community gatherings. Our upcoming educational space dedicated to developers in San José. July meetup in Panama to reach the growing community in the region. We are confident these efforts, our geographical location and technical abilities will contribute greatly to the EOS network. Love the positivity!!! Wishing you all the best and keep up the great attitude!